Descubre los dos pueblos medievales más famosos y mejor conservados de la Toscana en este pequeño tour desde Lucca. 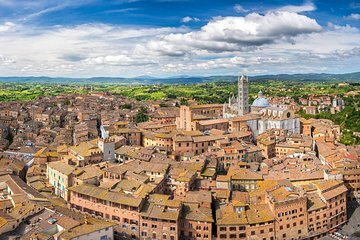 Vea por qué la ciudad de San Gimignano, declarada Patrimonio de la Humanidad por la UNESCO, ganó el apodo de "Manhattan Medieval" con sus imponentes torres de piedra, y visite la casa de la famosa carrera de caballos Palio de Italia en Siena. Termine su día en el país con una degustación de los famosos vinos de la región en una bodega histórica ubicada en las colinas de la Toscana. Excursión de un día a pueblos medievales y cata de vinos desde Lucca. Our Guide was Michele who was very insightful and entertaining . San Gimignano and Sienna was very picturesque and the history of both is so fascinating. The last stop of the tour was a quaint Organic Winery in the Tuscan Hills, what a lovely way to end the day. Another fabulous trip! San Gimignano was by far my favorite town! Don't miss this! And the wine tasting at the vineyard is an amazing experience- very true to a Tuscan style! Loved everything about this trip and our guide, Luca, was also wonderful! He was so enjoyable, answered lots of questions, kept smiling all day long! Luca is a very energetic and enthusiastic tour guide. His Engliah is excellent and easy to understand. His knowledge, interest and lore of Tuscany makes the destinations all the more interesting. He met us in the town center of Lucca, where we were staying. It was not automobile accessible, so he came to our Bed and Breakfast and escorted us to the air-conditioned Mercedes van that was located about three blocks away. He was right on time. He was both the tour guide and driver. He then picked up the other riders in Lucca and Pisa and drove us on toe San Gimignano. He gave us the correct pronunciation so we could practice it a few times before our arrival. Meanwhile, we would point out sites along the way. We saw the Tower of Pisa from a distance, the olive orchards, vineyards, marble quarries, the Apennines, ruins from the middle ages and explaining some of the histories in the locations that we were driving through. Luca explained the importance of the different types of marble and how green marble was often used in the churches. Today the green looks almost black. The supply of green marble is so rare now, that it is hard to find to mine nowadays. He provided us with maps of San Gimignano and walked us through the town, pointed out several points of interest, explaining their significance and allowed us about 45 minutes of free time to explore on our own. With the town being relatively small but with a lot of interesting shops and architecture, it proved about the right amount of time. After a 15-minute wait, one of our guests never showed up. Lucca walked back into town and found her. We waited perhaps another 15 minutes. He was very good about handling the situation and not embarrassing the lady nor making much mention as to what occurred. Our next stop was Siena. What a magnificent town. We opted for the personal tour. A local guide, Michela, who grew up in Siena, gave us a detailed account of the town. He started by taking us into St. Catherines Cathedral. There, he was able to explain to us the significance of the large paintings, the viewing of her head and finger. He did thoroughly explain her history. We then walked around the town where he pointed out the architecture, its significance, the place where St. Catherine grew up, the neighborhood boundary markers that are still used today, whereby there are about 16 major groups that make up the annual horse racing that each neighborhood sponsors horse and rider. Micheles descriptions made the place come alive at times. We also saw photos of the horse racing in Sienas main plaza. Michele then gave us free time, about 45 minutes to get back to our van and to grab a bite a lunch. This proved to be exactly the time we needed. We all got back into the van and toured the Tuscan countryside as we headed back toward San Gimignano. We went to a reconverted farm house that now houses an organic winery just across the valley, where you could easily see many of San Gimignanos towers. The wine and olive oil samplings were served on outdoor tables under needed umbrellas as the sun was out and no clouds visible. It was very relaxing, peaceful. We had plenty of time to stretch our legs, purchase any wine/olive oil that we may have wanted. Then we had another beautiful drive back to Pisa and Lucca to drop off us passengers. Luca was very attentive, fun to be with, and drove quite well. We had zero white knuckle moments! The tour, the Mercedes van and Luca made this tour an exceptional value for the money spent. Trying to find places to park and negotiate driving in these towns would be difficult for a person unfamiliar with the region. The tour in small groups may cost a little more, but you get so much more out of it. You are able to ask more questions, hear everything that is going on, have a tour that may be slightly tailored to the groups interest. We had a wonderful day! Alessandra and Piero were so knowledgeable and friendly. We 2 travelers were picked up in Lucca at our hotel on time and greeted with a welcoming smile. Two additional couple were picked up along the way and Alessandra kept the conversations going. Once in San Gimignano and Siena, Alessandra walked us to the main areas explaining the sights and then we were allowed time to explore the areas ourselves. We were allowed ample time to explore. Then we went to a winery with a beautiful view of San Gimignano. We sampled wine and were given cheese, Bread, olive oil and balsamic vinegar. Bellisimo! Would highly recommend this tour! A great day with Alex and Luca. They were really informative and showed us around a bit and then let us explore on our own. We traveled with our 6 year old and she really enjoyed the ride, the walk through the towns and of course the food. We paid for a private guide in Siena and we walked with Chiara. She had a wonderful sense of humor and was extremely knowledgeable about Siena, since she was born there and still lives in town. We highly recommend this tour with the add on of the private tour! the driver that picked us up was excellent and very knowledgeable and funny. He made the tour very pleasant despite the rain storms. San Gimignano was wondrous. then we went to siena, we also booked a guide for Siena that I would not recommend. she was not at all interested in really spending time with the group and would not wait for those who were physically impaired and could not keep up. She could not wait to get to her next group that were waiting at the end of her whistlestop very brief guide. I would not recommend this part of viewing Siena, that was very disappointing. The wine tasting was fabulous, the staff were tremendous and the owner went out of his way to provide us with additional entertainment, wine and food that we were not expecting. Though it was an early start and a long day, this was a great trip. Our guide/driver Emilia was lovely - so friendly, bubbly, and a fountain of knowledge. We opted to have a specialist guide in Siena and she too was terrific. San Gimignano and Siena are both beautiful and just wish we could have had more time in each. Perhaps a separate tour to San Gimignano might be possible in future? We also enjoyed the wine tasting at the end of the day so wouldn't wish to miss out on that. A very worthwhile and excellent value tour. Excellent Tour Guide. Great value for the money. Very informative and a fun day.